Just Intonation uses a dynamical instant tuning scheme which works as follows: The Midi input unit informs the tuning module about all keys that are pressed or released. This means that the tuning module knows the actual pattern of pressed keys at any time. If N keys are pressed there will be N(N-1)/2 intervals between them, and the goal would be to tune them justly with the correct rational frequency ratios. Each of these natural ratios differs from the standard ET by a certain amount of cents (1 cent = 1/100 of a semitone). 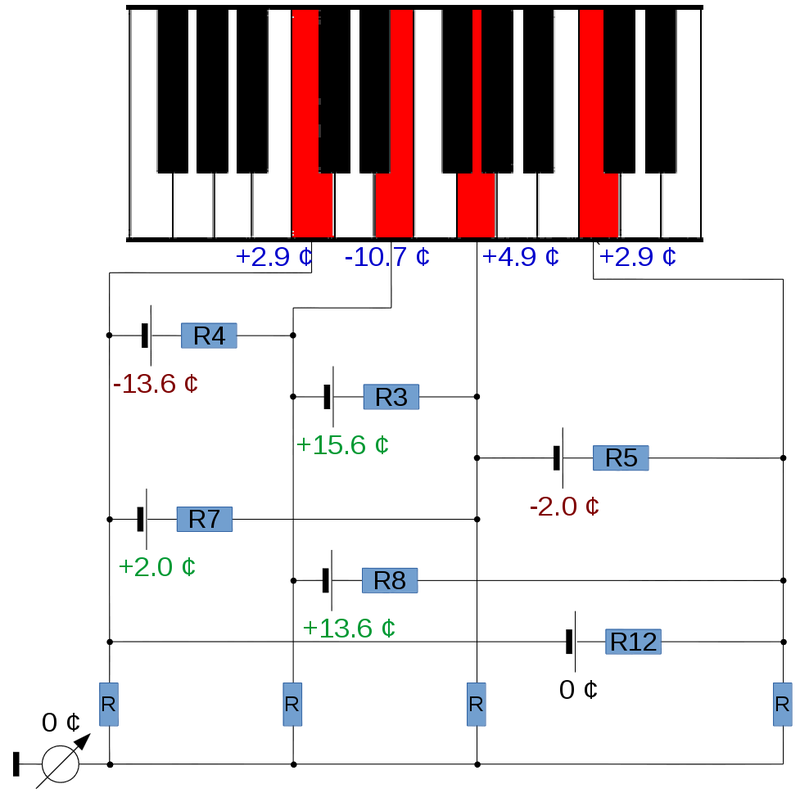 Our tuning scheme is most easily explained in the terminology of an electric circuit. The figure shows the example of a C-major trichord. Each pressed key (marked by red color) is regarded as an electric contact whose voltage is just the pitch deviation relative to the equal temperament (ET) measured in cents. In the example the four keys make up six possible intervals (C-E,C-G,C-C, E-G,E-C,G-C). For each interval we attach a battery and a resistor. Each battery has a voltage corresponding to the ideal pitch deviation against the ET in cents. 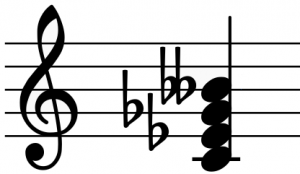 For example, a perfect fourth in just intonation is -2 cent flat relative to the ET. Together with the resistors, which will be explained below, this electric circuit can be computed by solving Kirchhoff’s laws, resulting into a linear system of equations. With today’s technology, such systems can be solved within fractions of a millisecond. To avoid an undetermined situation one has to fix the reference voltage with very high resistors in the lower row. This allows one to control the global pitch of the tuning. Finally, the computed voltages are then sent to the inbuilt microtonal sampler. In the example shown in the figure all voltages match perfectly so that all electric currents are zero, independent of the values of the horizontal resistors. This means that a C-Major trichord can be tuned exactly in just intonation. Obviously this applies to any other major trichord as well, hence the tuning scheme is by construction scale-invariant. Not every chord can be tuned exactly in just intonation. An extreme example is the diminished seventh, which divides the octave in four minor thirds. Since a minor third in just intonation is +15.6 cents larger than in the ET, four of them would make up a pitch difference of +62.5 cents, but of course the octave should have 0 cents. In this case the battery-resistor network will reach an equilibrium in which electric currents are flowing. In this case the resulting voltages will depend on the values of the horizontal resistors, establishing a compromise for the tuning of such chords. The resistors have to be chosen in such a way that “Important” intervals such as the major fifth should have a small resistor (high conductivity) while “less important” intervals should have a higher resistor (low conductivity). Apart from this qualitative rule, the choice of the resistors is basically a matter of taste. For more detailed information please download our paper on adaptive tuning.